M. Leighton is a soulful writer. Her words touch the deepest parts of me. They evoke such strong emotions. I find myself laughing, smiling, and crying, as I find myself on the same journey as her characters. Her writing is effortless. The way her stories flow seamlessly, make me feel like she is bestowing a rare gift; one that a vigorous reader like myself can enjoy. The beauty in her stories touch my heart, and make me so happy. They offer such a breathtaking escape, and passionate reprieve from everyday life. Eden moves with her six year old daughter, Emmy, to the small town of Miller's Pond, Maine. As readers, we know that she has moved around a lot, and that she is on the run. However, we don't know who she is running from or why. Eden homeschool's her daughter and keep's to herself. She has a very special bond with Emmy, and she is her number one priority. Cole is in a life of self-isolation. His seven year old daughter died, and he is grief-stricken, a shell of the man that he used to be. One day when he is building a large sand-castle, he turns to find a beautiful little girl and her mother watching him. He is startled when he see's the striking resemblance that the little girl, Emmy, has to his dead daughter. When he looks into the eyes of her mother, Eden, it is like the broken pieces of their souls speak to one another. Eden finds out that Cole is her landlord. He lives close by, and Emmy, (who doesn't talk to strangers, and is anxious around most people), seems to feel comfortable, and genuinely likes him. Eden and Cole are not at a place in their lives where they are looking for a relationship. 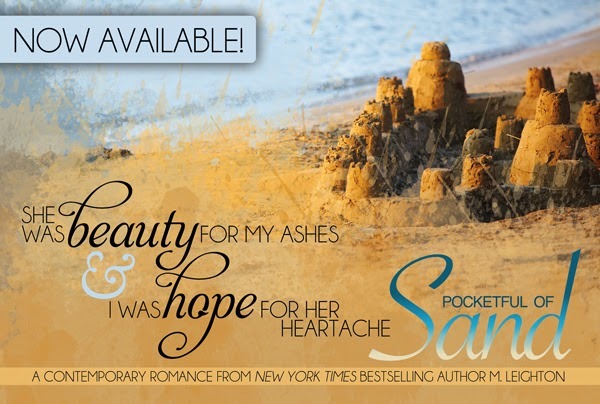 They both are broken, and have experienced the heartache and devastation that life can bring. In each other they find solace, peace, friendship, love, passion, and healing. 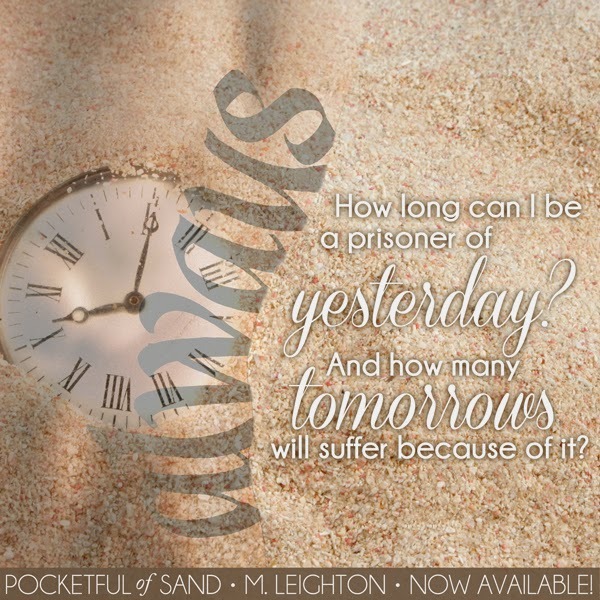 Pocketful of Sand, is a story that was so beautiful, and meaningful to me, that I fear my words cannot do justice to how amazing this book is. I loved Eden, Emmy, and Cole. Eden had a silent strength, courage, compassion, and resilience. She was a character that I connected with and loved. Emmy was a great addition to the story. 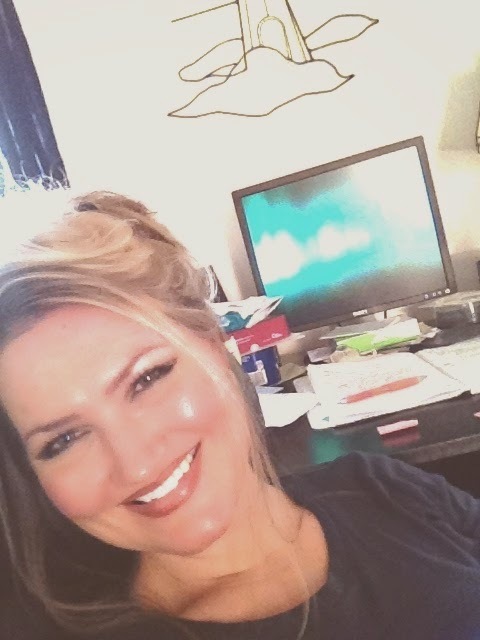 I loved the bond that she had with her mother, and she made me think about my own daughter, and how much I love her, and how I would do anything for her. Cole was a gentle soul. He was broken inside, and was in so much internal pain. I loved all of the moments he spent with Eden and Emmy. He was caring, loving, and giving with them. The passion that he shared with Eden was intense, and meaningful, with the added layer of deep and profound emotions. 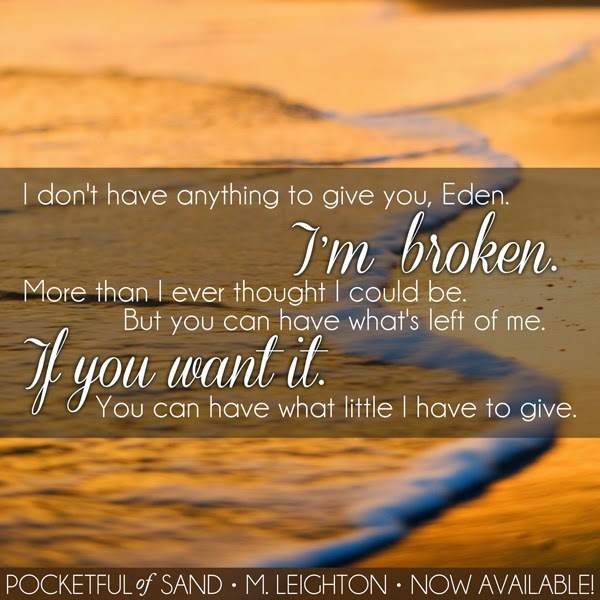 I give Pocketful Of Sand, by M. Leighton, 5 Exquisite, Intoxicating, Heart-Stopping, Breathtakingly Beautiful, One Half of a Whole Filled Stars! This story is the kind that gets deep inside of your heart, and touches your soul. This book is one of my all-time favorite reads, and will be on my 2015 Top Romantic Reads list. Sounds like a really beautiful read, I love it when an author can move us so deeply with story he/she has written and the characters just sound like the type I'd love to root for. Another great review Lindy! I loved this book so much! The ending twists were great too! I want more now! So happy to hear this is a good one. I've been waiting for it to come out. 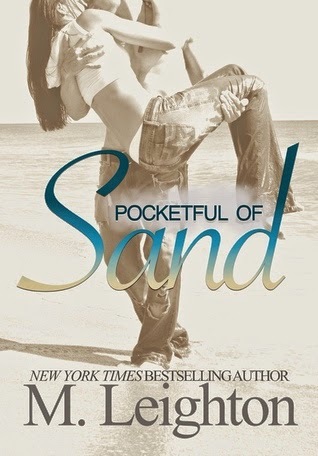 Need a good beach read with all this crappy freezing weather we've had.